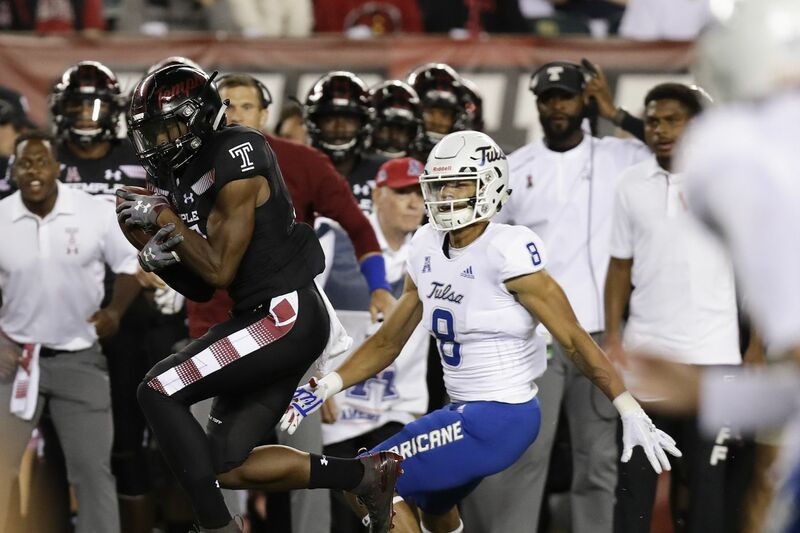 Temple cornerback Ty Mason intercepts the football in front of Tulsa wide receiver Keenen Johnson during the first-quarter on Thursday, September 20, 2018 in Philadelphia. Mason scored a 36-yard touchdown after the interception. Temple's Ryquell Armstead enjoyed several career milestones and the Owls followed his lead. Armstead went over the 2,000-yard career rushing mark, scored his first touchdown of the season, moved up the career chart for rushing touchdowns, and recorded his first career sack as Temple defeated Tulsa, 31-17, at Lincoln Financial Field in Thursday's American Athletic Conference opener for both teams. Temple (2-2) has won two in a row and now prepares to visit No. 23 Boston College on Sept. 29. Armstead had surpassed the 100-yard rushing mark before the end of the third quarter, and he finished with 108 yards on 24 carries. Before last week's 35-14 win at Maryland, Armstead had never rushed for 100 yards in consecutive games. Now he has achieved the mark in three consecutive games, becoming the first Temple player to accomplish that feat since Bernard Pierce had three straight in 2011. Armstead scored his first touchdown of the season on a 22-yard run that extended Temple's lead to 21-7 with 3 minutes and 19 seconds left in the second quarter. It was his 22nd career rushing touchdown, tying him for fourth on the all-time Temple list in that category. The 5-foot-11, 215-pound senior from Millville also recorded the first sack of his career in the third quarter, being utilized as a situational pass rusher at defensive end. "This is the healthiest I have been in a while," said Armstead, who dealt with a nagging toe injury last season. "This is Week 4 and I feel great and I am just trying to contribute to my team." For the second straight game, redshirt sophomore Anthony Russo started in place of injured Frank Nutile at quarterback. Nutile, as he did last week, warmed up before the game but stayed on the sideline. Russo completed 7 of 20 passes for 112 yards, no touchdown and two interceptions. He also scored on a 1-yard run. Unlike last game when he didn't learn until an hour before kickoff he would be starting, Russo was told Thursday's morning he would start. "I had the whole day to mentally prepare for what I needed to do," he said. The Owls also used junior Isaiah Wright as a wildcat quarterback, and redshirt freshman Todd Centeio also played quarterback. This was a game where the Owls' defense went on the offensive, scoring two touchdowns. The first opened the scoring when cornerback Ty Mason returned an interception 36 yards for a touchdown with 6:23 left in the first quarter. In the third quarter, the Owls' Quincy Roche caused a fumble that was scooped up by defensive tackle Karamo Dioubate, who returned it 50 yards for a touchdown that increased Temple's lead to 28-10 on the first series of the third quarter. The 6-foot-3, 295-pound Dioubate showed good speed and running ability on the return. "It felt good celebrating with my teammates and having fun," Dioubate said. After the game defensive coordinator Andrew Thacker said Dioubate has might have made the biggest improvement from last year to this year. Dioubate says the improvement came from old fashioned hard work. "Just keep trusting the process, taking stuff day by day and keep improving," Dioubate said. Despite the two defensive touchdowns, Tulsa was able to move the ball and the Golden Hurricane remained in the game after Corey Taylor's 5-yard touchdown run cut Temple's lead to 28-17 with 10:07 left in the fourth quarter. It was Taylor's second rushing touchdown of the game. On the next series, Tulsa had a first-and-10 on the Temple 24-yard line when Sam Franklin forced a fumble that was recovered by linebacker Chapelle Russell. Tulsa was called for a horse-collar tackle on the return, giving the Owls the ball on their own 49 with 7:09 left. It was Tulsa's fourth turnover of the game (with the fifth coming later on a Benny Walls interception). The Owls defense had to be in shape because Tulsa, with its fast-paced offense, ran 107 plays. Tulsa converted 13 of 23 third down plays and four of five on fourth down, but the Owls big plays negated the Golden Hurricane's late-down success.